Photo source: Alain Bachellier. Some rights reserved. The Shawiya are Berber shepherds living mainly on the Aures Plateau of the Atlas Mountains in northern Algeria and Tunisia. The Africans call this entire region of North Africa Maghrib. The Berber refer to themselves as Imazighen, or "free and noble men." This term has become an indicator of Berber identity and nationalism. The inaccessible peaks of the Atlas Mountains have long served as a refuge for the Berber. These rugged mountains provided a base of resistance against the Romans, Vandals, Byzantine, and Arabs. However, the Muslims conquered the Maghrib between 670 and 700 A.D. The Shawiya are a part of various Berber groups that have risen in Algeria to defend their identity. In general, they are sturdy, thrifty, hospitable, and lovers of the soil. They are also proud, shrewd, persistent, and loyal. In particular, a passion for independence is deeply ingrained in their culture. The original inhabitants of the lowlands of the Sahara Desert were greatly influenced by Arab culture. The Shawiya, however, took refuge in the Atlas Mountains and were able to sustain and preserve their own language, culture, customs, and social organization. Today, most Shawiya are shepherds and farmers. Their staple crops include grains and fruits that are cultivated in the mountains. Along the edge of the desert, they live as nomads, migrating between the highlands and the desert. They primarily raise sheep and goats, and most also have a few mules and donkeys, which are used for transportation. During the winter, they move their herds to the warm plains, then to higher pastures during the spring and summer months. Shawiya villages consist of close-knit, extended family groups, which trace their ancestry through male lineage. Many of the villages are located on the crests of hills. Although they move frequently, the Shawiya never leave the villages unattended. A few people stay behind to guard the granaries and to plant crops. 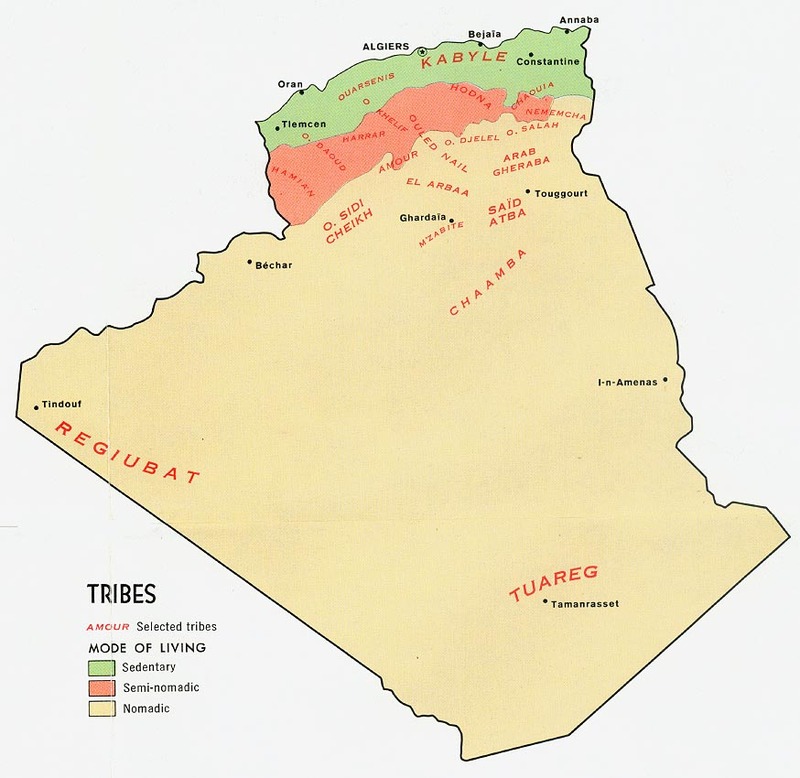 Traditionally, Berber local government consisted of a jamaa (village council), which included all adult males and legislated according to local custom and law. Arab efforts to modify that system were not very successful, and it has since continued to function alongside the civil government imposed by the state. In late 1993, after armed Muslims attacked several Berber villages, Berber nationalists proclaimed that they have suffered repression for many years and that the government refuses to recognize Berber identity. In addition, it is reported that the assault by Muslims against the Berber has reached the proportion of full-scale war. There has recently been a series of armed attacks unfolding in the Berber regions of the Kabyle and Shawiya (the town of Batna, in particular). After a bitter war, Algeria gained its independence from France and instituted a socialist government. However, independence and the political system that followed have failed dismally. Since independence, the government has zealously encouraged the formation of an Islamic Arab state. Although they accepted Islam as a new religion, the Berber also maintained their pre-Islamic cultural and ritual traditions. The acceptance of Islam and the adoption of Arabic ways never completely erased Berber culture. Although they are nominally Sunni Muslims, most Shawiya have little knowledge of the practices of the Koran and other dimensions of Middle Eastern Islam. After Algeria's independence, Christian missionaries were expelled from the country in several waves. The remaining missionary efforts have since deteriorated. Proselytizing is not allowed, and opposition to the Gospel is intense. As a result, the option of the Gospel has never been fairly presented. 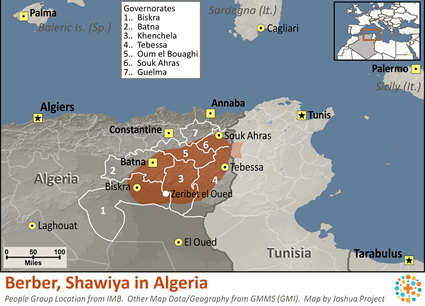 Most of Algeria's various peoples, including the Shawiya, remain unreached with the Gospel of Jesus. * Ask the Lord to open the doors of Algeria to the preaching of the Gospel. * Ask the Holy Spirit to grant wisdom and favor to any missions agencies focusing on the Shawiya. * Pray that God will save key leaders among the Shawiya who will boldly declare the Gospel. * Ask God to raise up prayer teams who, through worship and intercession, will begin to break up the soil of the Shawiya hearts to receive the seed of the Gospel. * Pray that strong local churches will be raised up among the Shawiya. * Pray for completion of Bible translation in this people group's primary language.View Berber, Shawiya in all countries. Location in Country: Khenchela, Tébessa, Biskra, Batna, Oum el-Bouaghi, Souk Ahras, and Guelma provinces: Aurès mountains, south and southeast of Grand Kabylie.